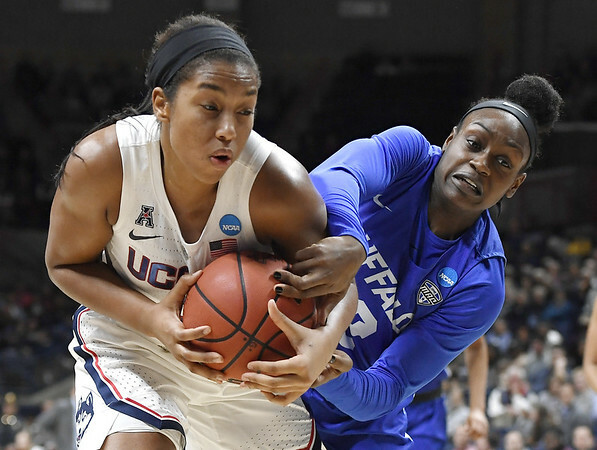 No one needs to remind Megan Walker that she did not get off the bench in the UConn women’s basketball team’s overtime loss to Notre Dame in the 2018 NCAA Final Four semifinals in Columbus, Ohio. But the sophomore wing is a big reason the Huskies were on a plane Tuesday to Tampa, Florida, for another national semifinal matchup Friday night with the reigning national champion Irish. The Final Four bid is UConn’s 12th straight and 20th overall. It started for Walker in the season opener with 15 points and six rebounds against Ohio State. And while she and her team have had their rough patches, the Chesterfield, Virginia, native is in a good place heading to Amalie Arena. In 35 games (she missed two in December with strep throat), she is averaging 12.0 points and 6.3 rebounds. She was named to the all-American Athletic Conference third team. In seven postseason games, she’s at 13.1 points and 7.9 rebounds. After being named to the AAC all-tournament team, she has played all but three minutes of the last three NCAA Tournament games. If there was a positive to Katie Lou Samuelson not being able to play in the AAC Tournament, it was how Walker and freshmen Christyn Williams and Olivia Nelson-Ododa responded. That came through in Sunday’s 80-73 win over Louisville in the Albany Regional final. The Cardinals, as they did in their Jan. 31 home win over the Huskies, were willing to give Walker the open 3-point shot. In the rematch she answered the challenge by nailing four treys in the first half as UConn took a seven-point lead. Her biggest 3 may have come in the first quarter with Louisville on a roll and holding its biggest lead at four points. Walker had her shoe come off two possessions earlier and struggled to get it back on. But she still found nothing but net from behind the arc that started a 10-0 run that put the Huskies in front to stay. Walker didn’t make a basket in the second half but continued her strong work on the boards against the Cardinals’ front line. She finished with 12 rebounds to help the Huskies to a 42-36 advantage. That followed an 11-rebound effort in the Sweet 16 win over UCLA Friday night. And Walker capped off her first NCAA Tournament double-double with a free throw with 14.9 seconds that made it a three-possession game and started the celebration. All five starters hit double figures for the Huskies and they accounted for all 80 points. Samuelson led the way with 29 followed by Williams (16), Walker (13), Napheesa Collier (12), and Crystal Dangerfield (10). But in his postgame analysis, Louisville coach Jeff Walz highlighted Walker. “Samuelson made some big shots, but I’ve got to give credit to Megan Walker,” Walz said. “Megan Walker was the difference in the first half. At times you’ve got to roll the dice a little bit and I thought we did a really good job on Napheesa. But we backed off of Walker at times to help on Collier, and she knocked down shots. I thought she was the difference for them. And I know it was in the first half, but she really kept them going and gave them a bounce." All the way to Tampa. Posted in Newington Town Crier, UConn on Wednesday, 3 April 2019 21:38. Updated: Wednesday, 3 April 2019 21:41.